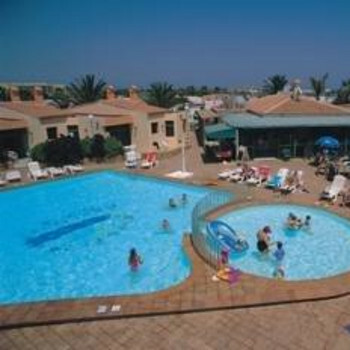 We have just had a really relaxing quiet break in this complex, the staff were friendly and helpful, the pool was exceptionally clean, the only minor complaint we had, which was nothing to do with the complex, was that the neighbouring house had dogs that barked from 6am for a couple of hours every morning, so we had an early rising each day!! We have just arrived back from the castillo bungalows 2 days ago, and can't stop telling everyone what a good time we had. We found the bungalows spacious for the 2 of us. Very clean and well equipped for self catering. They were cleaned everyday except the weekends. The staff were very helpfull at all times. The bar staff were very friendley. Bob especially ( a very happy scot ). we found the bungalows within easy walk of all the bars, restaurants and night life and the beaches. All in all we had a wonderfull time. and would advise any one to go there. we definatley will go again. Best breakfast around was Lins bar at 2.95 euros for a full mashing. Rooms were basic but very clean, self catering facilities were limited only 2 electric rings & a microwave, but fine once a sharp knife and bottle opener were purchased! Rooms were cleaned and towels changed daily except for Sundays and national holidays. At only 40 Euros a night it was hard to find fault with the accomodation and although we probably wouldnt visit the resort again would recommend the accomodation for a cheap holiday. Fantistic week in these apartments. Not too crowded round the pool, plenty of sun beds. Everythng very clean, maid service every day. I cannot imagine how anybody could not be happy with this place. Great location for bars and beach. Will go again, but will book own flights etc as hotel rates very cheap if booked direct. Just got back from Fuerteventura and I am well happy. The Hotel was clean, the rooms where fresh when we arrived and regular daily maid service was excellent. Pool was also cleaned as well, which was nice see. The location was also good. The local restaurants and shops are about 5 minutes down the road and the beach also about the same distance. Close to the airport as well so transfer times are at a minimum around 10-15 Min's. All staff were friendly, smiling and saying "hello" when possible. We never really needed anything but i'd imagine if we did all would be fine. The resort itself offers no real entertainment, though the independent bar on site does offer Karaoke, music and Quizzes. This having been said its probably better for couples as opposed to families. Only gripe which was a tiny one, is that most of the reclining loungers by the pool were broken. However this may have been changed. Overall experience was though Excellent! Would definitely recommend it and would go again. Stayted at the Castillo Playa Bungalows for a week and had a brilliant time. Got a last minute deal so certainly got value for money. The bungalows are a good size and well equiped and very clean. The friendly cleaners came every day. The pool is clean and there are plenty of sun beds. The irish pool bar is a very welcoming place, the barmaid will be more than happy to fill you in on the resort giving you advice on where are the best places to go. As it was June when we went I dont think it was lively as it would be in july/august, so the pool bar was quite quiet on an evening. However, they did still offer karaoke and quizzes. It is only a 5 minute walk away from the bars and resturants, so not disturbed by any noise. The beach is also a 2 minute walk away so a very handy complex.